My parents started me on the right path to accomplish my goals and succeed in college and in life. When I was growing up, I did not understand the benefits of the discipline that they taught me. Now, I realize it has made the man I am today. They taught me to never give up and take every chance to enhance myself to become a better student, man, and one day a leader of a family. Since college, I have had the best experience that I could ask for. I started my collegiate journey enrolling at Ivy Tech Community College as a Mechanical Engineering Technology student. While at Ivy Tech, I was presented with many opportunities through different organizations and clubs I joined. I first joined the Bowen Scholars Program in December of 2013. In this program, I met Ms. Cheri Bush and Andrea Thomas. During my first semester in the program, my mother passed of congestive heart failure, however, being in this program helped me to open up about how I felt and grow personally and spiritually. Without their help and support, it would have been difficult to continue my collegiate journey. The Bowen Scholars program also allowed me to grow my professional network. I was invited to have dinner with the mayor at the International Citizenship Awards, meet Senators and state officials, and I was able to represent Ivy Tech as the student Ambassador to meet President Barack Obama when he came to Indianapolis. In November of 2014, I was sitting out in the hall of Ivy Tech Community and Mr. Lamarcus Hall came out and asked me if I would be interested in joining the Collegiate 100 Indianapolis. 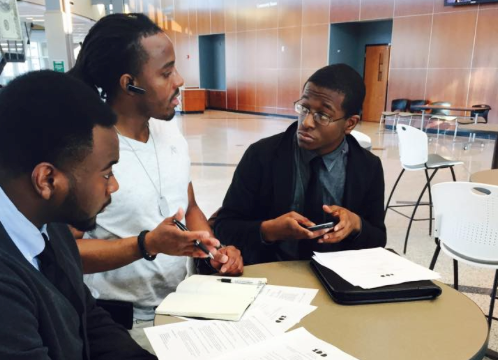 The Collegiate is a division of 100 Black Men of Indianapolis. Through this program, I was taught how to behave in certain formal events while being surrounded by successful men and women who have been where I am, and mentored me to hold myself academically, professionally, and morally to a higher standard. During the same month, I joined Collegiate 100 of Indianapolis, I started my first internship with Aerofab Division of Tube Processes. Ivy Tech courses prepared me for the workforce and allowed me to start working with less on-job training. The Mechanical Engineering Program, which Professor John Bradon Barnes Chair, later helped me to obtain my second internship with Johnson Controls Inc. I currently work at Johnson as a System Design Intern IV. Currently, I am a Senior at Indiana University-Purdue University Indianapolis. I plan to graduate in the Fall of 2016 with a Bachelor of Science in Mechanical Engineering Technology. I plan to pursue my Master of Science in Mechanical Engineering Technology part-time while working in the field so that I may obtain my Professional Engineering License. I can not express how much the support I received has shaped me into the man I am today. One of the Main focuses of Collegiate 100 is the mentoring of our youth. We find that youth are susceptible to influence, and if we can mold them before the wrong habits are engraved, we can develop strong young leaders for the next generation. These young men and women want guidance and something to look forward to for their future. Many times, they just need someone to show them the starting line. If there is anything I have learned from my experiences, it is that it takes many influences to shape your life into what you want it to be. Just going to college is not enough; the most accomplished individuals are those who continue to learn and continue to be progressive. Through this progress, we can shape the nation for next generation. Understanding that we have a legacy to uphold makes the challenge of building a nation seem unreachable, however, with mentoring of the next generation we can pave the road to enhance the nation to value the importance of mentoring and building each other up to alleviate the discrepancies between all people. Michael has been featured as an American Graduate Champion! Watch his champion spot, and learn more about the mentors in Michael's life and the impact they had on where he is today. Michael A. Wilson II grew up in The Brightwood Neighborhood on the east side of Indianapolis. He graduated of Ivy Tech Community College and is currently a Mechanical Engineering Technology student at IUPUI. He is currently an Intern with Johnson Controls Inc. and plans to pursue a career in the automation and controls field. How does education support a path toward achieving DREAMS?